I had a very enlightening talk with a director of one of the seven homeless shelter in my area. While at a gathering I struck up a conversation with a husband and wife and when I learned what she did I began telling her how cities, primarily in the West, were beginning to use modular construction, tiny houses and shipping containers to provide housing for the homeless and wondered if this was something that could help her. Her response was not at all what I had expected. She is totally against the modular housing idea and I have to admit that maybe the cities that are already trying it may be in for a big letdown. Homeless individuals tend to want to talk and be with others. Housing them in large groups, though not the best solution, is better for their mental well being than giving them a cubicle to sit in alone all day and night. Depression and anxiety will increase. Personal hygiene will begin to be overlooked by many. Her staff works hard to provide all the sundries needed and to promote good hygiene among the homeless. Sanitary conditions of the modular cubicles will become unbearable in many cases as they have never had to wash their clothes as staff members usually do it or make sure that bed linen is clean, walls and floors are clean and bathrooms, if each modular unit has one, is clean and sanitary. If the units are equipped with kitchens and have furniture, they will be quickly abused and/or sold. If one of these buildings were offered to her free of charge she said that the cost to ramp up her staff to do housekeeping for each individual unit would force her to close her doors. 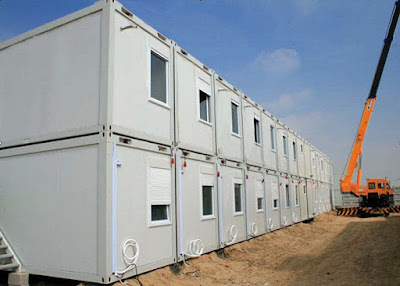 After listening to her thoughts about this I have begun to wonder if putting (warehousing) homeless in shipping containers and modular boxes is the right thing to do. You plainly have retired from selling Gary. Nothing she said precludes modular technology. You simply must not build tiny modules. Really from what she says you want more barrack and bunk house then dormatory.